Ari and Andreas know the O-Seven will never leave them alone. Ari is carrying Andreas's mortal child, but the vampire elders are convinced the child will be the first vampire baby and are out to posses it. Or kill it. Either way, Ari and Andreas will do anything to keep their unborn child safe, even if it means Ari has to go into hiding and leave Andreas exposed to the O-Seven alone. Nothing like starting the day in a cold morgue room. Arianna Calin shook off her primal reaction to her surroundings—stark, white walls, sterile steel counters, drainable floors, and the heavy scent of chemicals that didn’t quite mask the odors of death—and studied the body on the table. The victim looked like a small human, a preteen child, but the magical aura that hovered around her even after death told a different story. The cherub features with the soft wisps of silver-blonde hair curling across her cheeks belonged to a nymph. She’d been cruelly assaulted, leaving gashes and puncture marks across her face and body. She seemed vaguely familiar, but it was probably just the hair, a color common to her race. “These look like claw marks.” Ari narrowed her eyes and pointed to three deep linear gouges on the victim’s upper arm. She leaned forward for a closer look, looping her blonde hair behind her ears to keep it out of the way. Ari cocked her head and frowned. There weren’t any large predator lizards in the Midwest, supernatural or otherwise. Certainly nothing that would have attacked this childlike being or left such deep puncture marks. A thread of unease shot down her spine. The only creatures with three toes forward and one underneath that came readily to mind were the wereraptors who worked for the O-Seven, the brutal vampire elders who’d tried to kill her more than once. Ari dismissed her concerns as quickly as they’d risen. At seven or eight feet tall, the raptors were too big to have caused this damage. Besides, the pre-pterosaur creatures rarely left the O-Seven’s stronghold in Germany, and they certainly couldn’t wander around the American countryside without drawing attention. Ally Shields grew up in the Midwest, taught school on the East Coast, has visited forty-two of our states, and currently resides near Des Moines, Iowa, with her miniature pinscher, Ranger. Writing has always been a part of her life, and in late 2008, after a career in law and juvenile justice, she turned to full-time fiction writing. 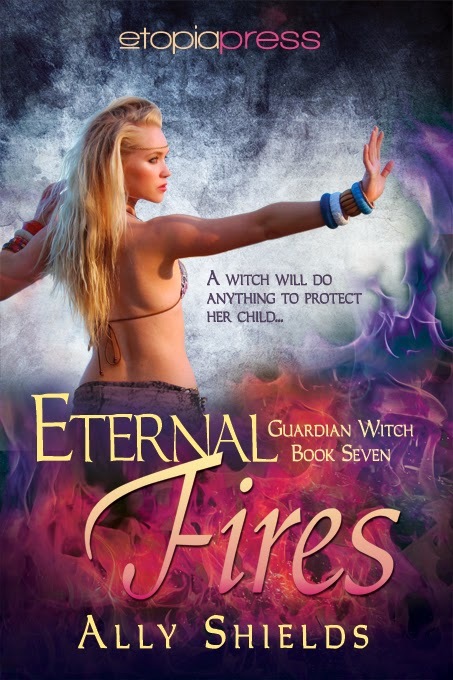 Her first urban fantasy novel, Awakening the Fire, was published in 2012, followed by six additional books in the series. She loves to travel in the US and abroad and incorporates many of those settings into her books. Ally enjoys talking with readers and is active in social media.